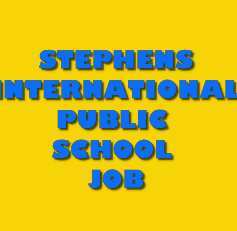 Stephens International Public School has invited online application forms to fill the posts of Teaching and Non-Teaching Staff. Candidates fulfilling all eligibility conditions can apply for the said recruitment by uploading their details and recent passport size photograph. through the link given below. 1. Post Graduate Teachers (PGTs): English, Physics, and Chemistry, Mathematics, Physical Education, Accounts, and Business studies, Economics, History and Political Science. Educational Qualification: Post Graduation in relevant subject with B.Ed from a recognized University. Educational Qualification: Candidate should be Graduate with B.Ed from a recognized university. 4. Activity Teachers (Music & Dance): Well-Trained in relevant field. 5. PTI (Male/Female): MPED/BPED from a recognized university. 6. Receptionist: Graduation/Post Graduation with basic Knowledge of computer. You are requested to fill online application form by uploading your recent passport size photograph on the following link by 25 Jan 2019.